Added on 21 May 2018 . By Anisah Audu. Taking over Colmore Row's Nosh + Quaff, is New York-style steak and seafood eatery Jailbird. This new concept is brought to you by the Lasan Group, who also own Lasan, Fiesta del Asado and Raja Monkey, and have taken over the space where Nosh + Quaff once operated. The restaurant has undergone an extensive refurbishment, as it aims to bring you Manhattan glam and sumptuous city vibes, with views overlooking Victoria Square. 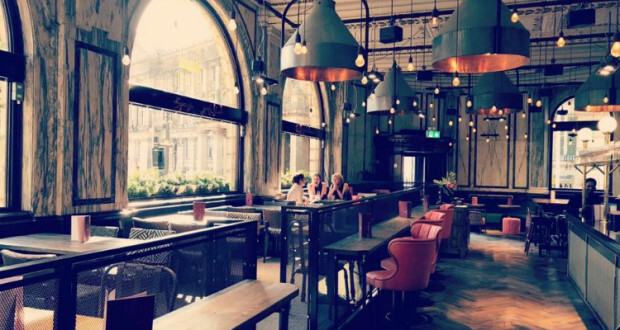 You can expect a bigger bar - perfect for post-work drinks, alongside the original Victorian features from the striking lights, banquet-hall style seating and grand furnishings. This beautiful city centre spot is a focal point of Victoria Square. With a Grade II listed building and spacious interior, you can relax in a cosmopolitan atmosphere. Lovers of steak and seafood will be delighted with the varied menu. The menu pays special attention to quality seafood and steaks, with starters coming in the form of velvety black risotto with prawns and the lavish caramel-glazed pork knuckle with freshly-baked sunflower and pumpkin seed loaf. For mains, think creole sea bass or the classic surf n turf. You can also expect vegetarian-friendly offerings and a lavish selection of cocktails.